The Activation Index, the Key, or Sacred Icon as the Covenant call it, is an object found in every Installation’s Library. It is the key needed to activate theInstallation, causing a reaction that will purge the galaxy of all sentient life. When inserted into the Core of the Ring, the Index activates the Installation’s main weapon. It is confirmed that an Index cannot be used to activate any Halo besides the one it is found on. The reason Alpha Halo’s Index worked on the replacement ring at the Ark was because they were both Installation 04. This may be found in all of the libraries on all seven Halos. John-117 noted in his debriefing of the Halo event that, if not for Cortana‘s intervention, he would have accidentally activated the weapon and destroyed all life in the galaxy. Halo’s main weapon exists primarily in case the Flood manage to escape containment and spread their infection to other planets. Only one firing of the rings occurred, at the close of the Forerunner-Flood War. The purpose of the Halo Rings is to destroy all sentient life in the galaxy, the Flood’s food source, so that the Parasite would starve to death. The rings are also used to house the Flood and keep them contained. The Index is vaguely ‘T’-shaped, with a faint green glow emanating from a stripe on each side. (InHalo 2, the Index not only glows green, but it also glows a blue color.) It is approximately two feet (60 cm) long. The object seems to be merely a digital storage device containing the software or access codes needed to activate the rings, as shown when Cortana activates the second Installation 04 with the Index stored in her memory. 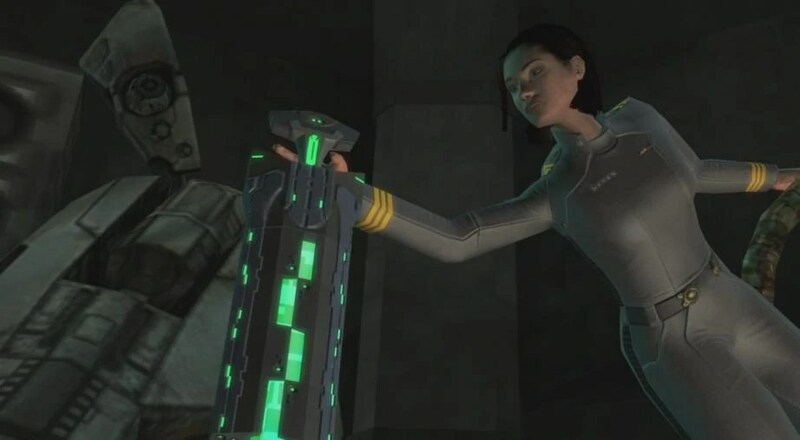 The “Sacred Icon” is first seen in Halo: Combat Evolved where, with the help of 343 Guilty Spark, John-117 located and attempted to activate Halo, but was stopped just before inserting the key by Cortana. Cortana then begins to argue with 343 Guilty Spark about the course of action to take concerning the Flood. After John-117 breaks up their argument, Cortana explains to him the true function of Halo. The Index appeared again in Halo 2, although it was for Installation 05. In an effort to stop the High Prophet of Regret from activating Delta Halo,Commander Miranda Keyes proceeded to the Installation’s Library to acquire the Index. In the course of obtaining the Index, she and Sergeant Avery J. Johnson lost it to Tartarus and his Brutes when they were ambushed by Thel ‘Vadamee. Tartarus then took the Sacred Icon to the Hierarchs, and the High Prophet of Truth ordered Tartarus to activate Halo and initiate the Great Journey. Knowing he needed a “Reclaimer” to activate the Forerunner installation, he took Keyes to Delta Halo’s Control Room where he attempted to force her to activate the ring. He was interrupted by Thel ‘Vadamee’s return, and after ‘Vadamee’s attempt to convince Tartarus that the Prophets had betrayed him, he forced Keyes’ hand into the Index to activate it. Tartarus is then killed by Thel ‘Vadamee and Johnson, and Commander Keyes was able to pull the Index out of the Control Room. This act put the Halo Array on standby mode, allowing them to be activated from Installation 00 (The Ark). During the Battle of Installation 00, John-117 and Thel ‘Vadam discovered a newly constructed Alpha Halo. The duo saw this as a solution to destroy the Flood on the Ark, and John-117 recovered Cortana from High Charity, where she revealed that she had Alpha Halo’s Index in her memory banks. John-117, the Arbiter, and Cortana proceeded to the new Halo’s Control Room, activating the installation and destroying the Flood, the new Halo, and possibly the Ark. The Index of Installation 05 was last known to be in the possession of Commander Miranda Keyes. It is called “The Key” by the Gravemind in his lecture to John and Thel ‘Vadamee: “There is still time to stop the Key from turning”, although with his manner of speech, it is not clear whether he was directly referring to the Index as “the Key”, or just using a metaphor. The Index of Installation 03 was cached on the UNSC research facility Ivanoff Station prior to the station’s Raid on Ivanoff Research Station attack in 2557.Ur-Didact acquired it, planning on firing the Halo near Earth to wipe out humanity. The Terminals scattered within Halo 3‘s campaign levels entail that the Index may, apart from activating the Halos, be a record or copy of the life-forms that existed at the time of the Halo’s first activation. The Librarian states that she is in the process of Indexing all life forms, and that she is close to “saving them all”. This could be taken as meaning the Index contains a copy of all sentient life forms’ DNA, which would, in a sense, save the individual by preserving them beyond their death. This could also explain why an Index takes time to fabricate: the DNA of all sentient life-forms may need to be re-collected for a new Index to be made, which would take much time. However, it would likely take a fraction of the original indexing time as the location of all sentient life is already known, making collection of samples rapid and efficient. It could also be speculated that the Index must therefore be used to correctly fire the Halos as it contains a record of all the species which Halo must target. The Index, with its compilation of all sentient life in the galaxy, could instruct Halo to target them in the event of activation. The Index looks very similar to a symbol of Norse mythology called “Thor’s Hammer”, or MJOLNIR. This is the name of the armor that a Spartan-IIwears. Cortana physically picks up the Index, although her hologram is not solid. This may have something to do with the fact that it is a computer related object, though this is never stated in-game. It is more likely that Cortana was using a computer-generated image of the Index to prove her point, or that the Forerunner’s hologram projectors could actually be somewhat “solid” like the light bridges. The first time you see the index, at the beginning of the library on the first halo, it briefly unlocks because of an error in the scripting. The requirement of a Reclaimer to retrieve the index and then activate the Halo may be a failsafe that the Forerunners made to insure that theMonitors of the installations do not activate the Halos prematurely as they seem to be extremely overeager to activate them. Installation 03’s Activation Index is an easter egg in Halo 4. It is seen supended in a cylindrical glass case aboard the Ivanoff Research Station, along with other Forerunner artifacts found on the ring. The Index is white instead of green, this could mean that not all the Index’s are green. It is also worth noting that this Installation’s Index is at least twice the size of any other recorded one. The Activation Index for Installation 04’s size is described in the Halo: Combat Evolved Anniversary Kinect Library. It is listed as being 58.4 cm (23 in) long.